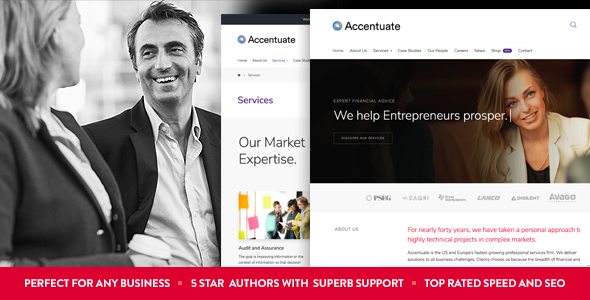 Whether youâ€™re an up and coming, rapidly growing consultancy with aspirations of joining the Fortune 500 or a small niche business professional, Accenture is the perfect WordPress theme to drive your business growth. Visual Composer Page Builder. Build pages with the included site builder â€“ change images, text and layout â€“ no coding needed! Complete control over the Design. Personalize fonts, colors, and layouts to create the look you want all within the customizer. With the included site builder and utilizing the full power of the WordPress customizer, see your changes happen instantly. There is no programming knowledge required â€“ create stunning and beautiful pages. Choose from hundreds of Google fonts! 100% Responsive â€“ Have a beautiful website â€“ on every device. Get beautifully formatted content on phones, tablets, and desktops. Your visitors can expect great looking content whether theyâ€™re at the office or on the go. Add a Retina-ready logo so your brand stays sharp, no matter the resolution. With over 10 million downloads WooCommerce powers 30% of online stores. Itâ€™s the fastest growing platform in the world and the perfect solution to start selling. As WooCommerce experts weâ€™ve taken great care to ensure Accentuate has better WooCommerce support than your average WordPress theme. Translation Ready and full WPML Support. Accentuate is fully compatible with the excellent WPML plugin meaning itâ€™s easier than ever to create fully multilingual WordPress websites with Accentuate and WPML. One Click Install Demo Data Get a turnkey website in seconds that closely matches the Accentuate Demo website. (Copyrighted images not included in the demo data â€“ grey placeholders are used in place). Have questions before you purchase? Just message us and weâ€™ll be happy to help. If you canâ€™t find what youâ€™re looking for you can send us a support ticket and weâ€™ll reply ASAP!